Phillips 66 blew past analysts' third-quarter forecasts thanks to strong profits from its crude oil refining business. 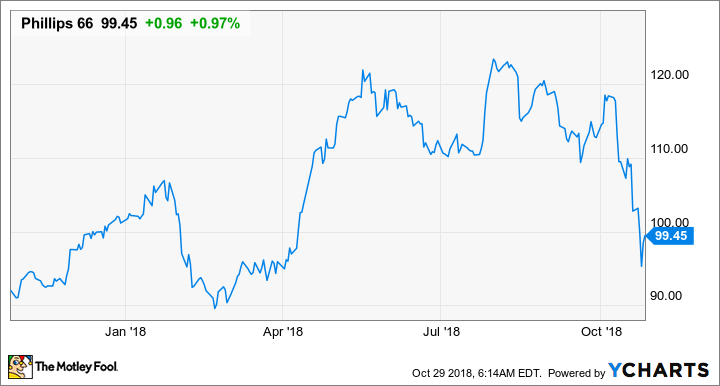 Oil refiner Phillips 66 (NYSE:PSX) posted results for yet another great quarter on Friday -- it handily beat earnings expectations and delivered a 99% increase in earnings per share. Despite that impressive third quarter, though, shares of the company have declined more than 15% since its Q2 earnings report. Looking into the numbers, it's not entirely clear why Wall Street keeps selling off this stock. Let's take a look at what happened last quarter, and consider what may have soured the market on Phillips 66. DATA SOURCE: PHILLIPS 66 EARNINGS RELEASE. EPS=EARNINGS PER SHARE. It shouldn't be too much of a surprise that Phillips 66's refining business performed as well as it did. Transportation bottlenecks for crude oil are creating wide price differences between the outputs of certain regions, and one of the largest such gaps is between U.S. and Canadian crudes. Phillps just happens to be the largest processor of Canadian crude in the U.S., so it benefited immensely from the fact that it's selling for $25 per barrel less than U.S. crude. What stands out in the company's report is that the rest of its business segments also performed well. Management noted that it benefited from several new transportation assets running at high rates, better than expected results from its CPChem joint venture with Chevron, and high margins for its retail sales. Data source: Phillips 66. Chart by author. A significant portion of Phillips 66's growth capital spending is in its midstream segment, through its investments in two master limited partnerships: Phillips 66 Partners (NYSE:PSXP) and DCP Midstream LP. This past quarter, the company announced it was going to provide transportation and logistics services to Ryze Renewables, which is building two renewable diesel plants in Nevada that will produce about 11,000 barrels per day. Compared to some of the other major investments it has made in transportation -- the largest being its 900,000 barrel per day Grey Oak pipeline from the Permian Basin to the Gulf Coast -- this renewable fuel system is quite small, but management said it will help the company better meet low carbon fuel standards in California. We've repurchased or exchanged nearly 30% of our initial shares outstanding over the last six years, contributing to our record adjusted earnings per share this quarter. We continued our commitment to distributions by returning $775 million through dividends and share repurchase in the third quarter and $5.2 billion for the year. Strong shareholder distributions remain fundamental to our disciplined capital allocation approach. We're investing in a robust portfolio of projects with attractive returns to create shareholder value and drive future growth. During the third quarter, Phillips 66 Partners once again achieved record adjusted EBITDA. PSXP has grown at a rapid pace during its first five years. With its scale and financial strength, PSXP is well positioned to fund and sustain a significant organic capital program to drive future EBITDA growth. One of the reasons that Garland focused on share repurchases is because the company bought $3.28 billion worth of shares from Berkshire Hathaway earlier this year. The deal was structured so that Berkshire could keep its ownership of Phillips below 10% and avoid the extra regulatory filings that would go with a larger stake. So far this year, the company has repurchased $4.1 billion of its own stock. You can read a full transcript of Phillips 66's conference call here. End of the line for refining stocks? Even though Phillips 66's business has performed well this year, the market hasn't given it much credit. One possible reason why is that the transportation constraints it has been benefiting from could start to ease in 2019 with the addition of the Grey Oak pipeline, as well as several others that will add millions of barrels per day of new capacity. Also, other companies are investing in port facilities to export oil. These infrastructure upgrades will likely knock down those regional price discrepancies significantly. At the same time, though, Phillips 66 has been growing the other parts of the business, which should help it compensate for any declines in profits from its refining segment. Also, its management team has proven shareholder friendly, with generous dividends and share repurchases benefiting its share price. Even though Phillips 66 stock looks cheap at only 8.4 times earnings, it's hard to say whether its recent price declines are an overreaction, or if the market is pricing in a significant profitability decline coming under the assumption that crude prices will normalize. Even if such a decline were to occur, however, the company's reputation for rewarding shareholders ought to be enough to put it on your radar as a potential investment.